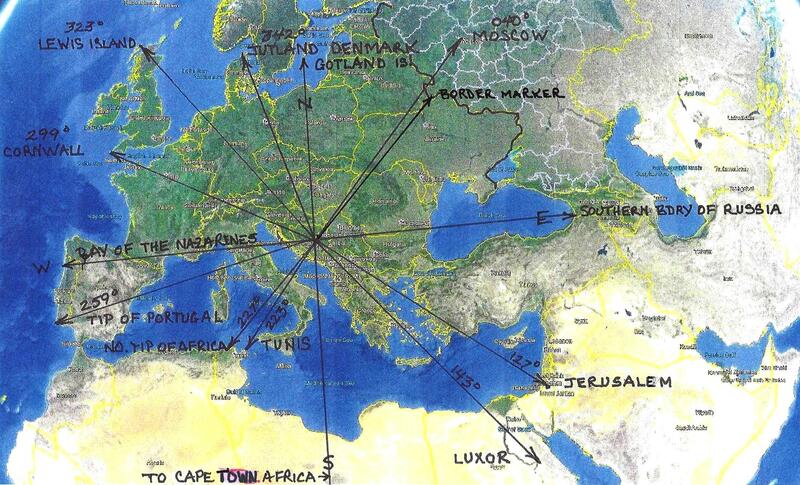 This is a group research project investigating Geoglyphs around the world. The project is headed by Arthur Faram of The Faram Foundation. Earths International Research Society asked one of it’s society members and Geoglyphologist Arthur Faram of ‘The Faram Foundation’ to investigate the most recent claims of a seemingly Aztec head found in google earth. This is the result of that research. The Faram Foundation has completed a geoplyghic study on a Peruvian Complex of the Ancient Caral. The Secret Message of the 1500 AD Juan de la Cosa Map. Over the past several years The Faram Foundation has been involved in the research and development of a new and emerging science. That science has been named Geoglyphology. You will realize as you scan through the website that this science has the power to rewrite history, as we know it. During our research it was discovered that down through time civilizations have secretly passed down a legacy of geoglyphs on the shores and highlands of land masses around the world. A well known example of this is the Nazca Lines in Peru. The reason the Nazca lines and other geoglyphs were not discovered until recently is that they are too large to be seen from the ground. And so it is with most geoglyphs. Extensive research on these geoglyphs, which exist on every continent and many islands around the world, have shown that, no matter when or where they were constructed, they all tie into a worldwide network of civilizations that have progressed, prospered and suffered setbacks for millennia. These geoglyphs range in age from the 10,000 year old Yonaguni Pyramid in Japan, to the 250 year old streets of Washington, DC USA. Data recovered from these studies includes obtaining the geographical range of the culture being studied, the level of sophistication that existed in relation to their understanding of mathematics and geometry, their knowledge of world geography, the discovery of other archeological sites that were unknown prior to the studies, and the dating of the culture itself by the data collected at the offsite locations and the sophistication of the geoglyphs identified at the dig site. Bearing – A bearing refers to the direction that any line, formed by a geoglyph, points in relation to “True North”. True North is used because as soon as you begin tracing a line away from the source, magnetic deviation becomes a factor. 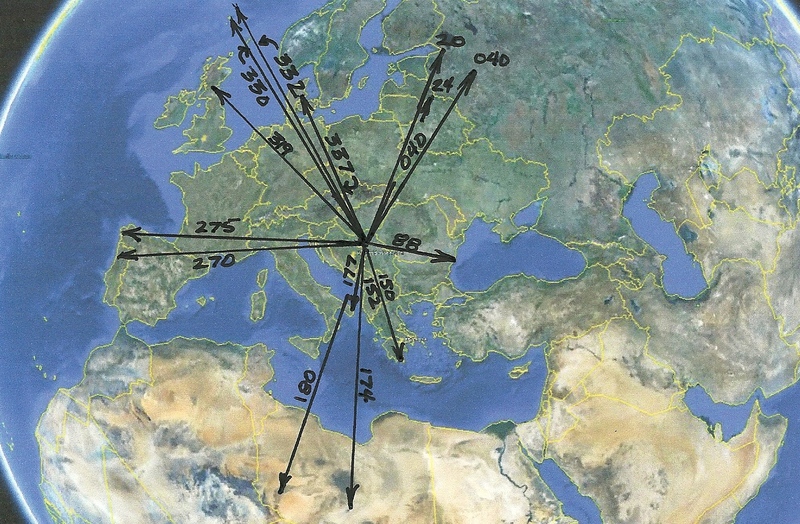 Magnetic Deviation exists all over the world and renders a compass useless over long distances because of the error it causes in a magnetic bearing. True headings are derived from Celestial Navigation, GPS, and computer software. These methods only produce True Headings which are not distorted by Magnetic Deviation. Radials – Radials are bearings after they leave the source. At the source Bearings (Magnetic North) and Radials (True North) are the same because no distortion has taken place by moving away from the source. Once a direction away from the source is plotted it must be plotted on a true course, not a magnetic course, in order to avoid magnetic deviation. 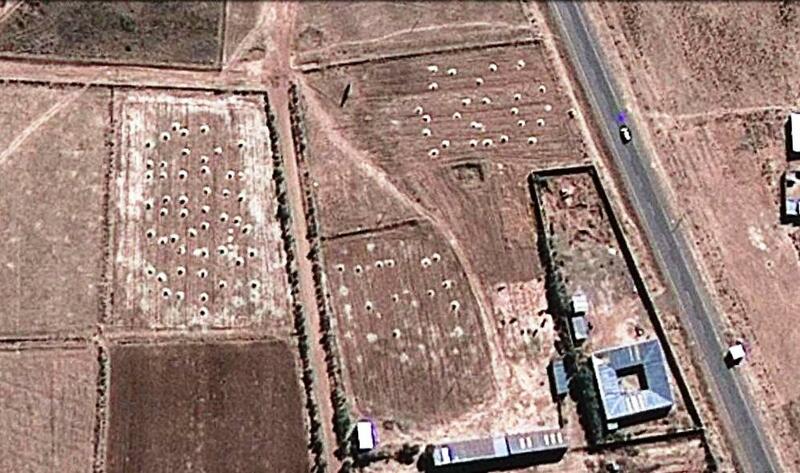 Geoglyphs, for the most part, are so large that they can only be recognized from the air. The civilizations that placed these signposts either had the capability of flight, or had a mathematical ability well beyond anything we could have imagined for the time. I have visited some sites on the ground and even knowing they are there I find them difficult to locate. The glyphs take on several forms. Some take the form of a triangle, another might be one or more circles, and another may be one or more lines touching or crossing each other. No matter what shape a glyph takes, any line can be a pointer to a place important to the creator of that glyph. 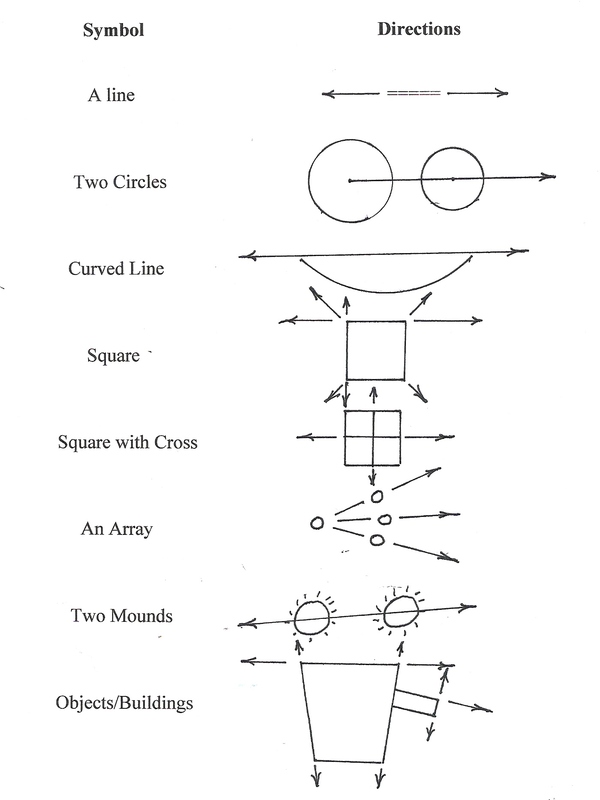 Below are a few examples of how bearings are derived from geoglyphs. 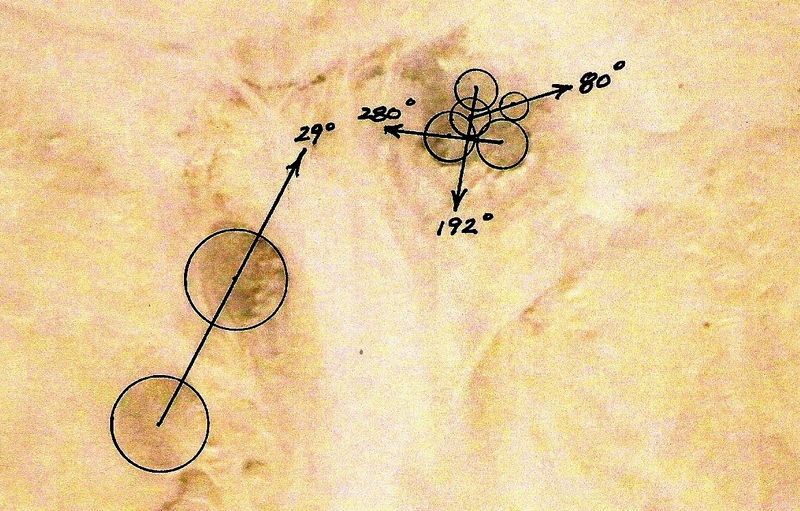 Above are a few examples of radials generated by various angles that may comprise a geoglyph. After applying the above criteria to a geoglyph it is then necessary to apply certain protocols, passed down for millinia from one civilization to another. These protocols allow the user to determine the destination and stopping point to which the bearings, eminating from the geoglyph, point. These protocols will not be covered here but are available by emailing afaram@thefaramfoundation.com and including your name and business association. After some study it was discovered that many mediums were used to construct geoglyphs. These included the arrangement of stones, the planting of different colors of flora, and the sterilizing of the ground, the scraping of the earth to reveal a different color underneath (Nazca), the changing of natural geological features with the features modified or supplemented, the wall alignment of structures (Caral), the alignment of Monoliths (Stonehenge), the alignment of Pyramids (Worldwide), the creation of stone and earth mounds, and more. For instance, the mounds of the Mississippian Indians, in the central United States have been proven to be geoglyph pointers. Ancient archeological locations, many previously unknown, were identified through Geoglyphology. The accuracy of the calculations of the ancient peoples is incredible. The GPS accuracy of the software program is seldom more accurate than the orientations of the ancients. By calculating the bearing at the source one can follow the extended radial for sometimes thousands of miles and locate a related glyph with little or no error. 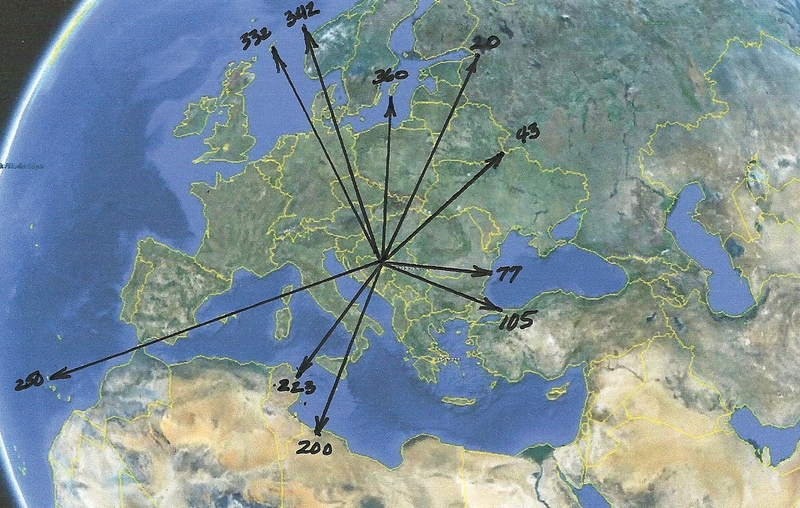 The percentage of success in locating a verifiable glyph or ancient location using each of the extended radials of any one glyph was variable, but ran in the range of 75% to 100%. Much of the lack of success was attributed to urbanization, overgrowth, vandalism, etc.. Surprisingly, based on the glyphs that were found, there seems to be an incredible amount of durability built into the geoglyphs. It appears that the meteorological conditions at any given site were considered in determining the materials used. At sites where rain and wind are seldom seen, most glyphs were made of earth. At locations that encountered rain and wind, stones and rock were used. Research results indicate that Geoglyphology holds great promise in expanding our understanding of the civilizations that have preceded us. Through the tireless efforts of many devoted archaeologists, and new methods of discovery, the world is on the cusp of a new awakening. To some this paradigm change will be quite uncomfortable. During any changes, to our current perceptions, it is suggested that we look to the benefits rather than retreating from the changes. Let us embrace the changes as a window to greater understanding and opportunities rather than a threat to the protocols of the past. This is a book that promises to change history forever. Much of the speculation about the history of man over the past ten millinia is brought to light, and documented, in Ancient Signposts. Through Geoglyphology a window into man’s past, from before 10,000 BC until the present, has been opened. Once you start reading Ancient Signposts you will not want to put the book down. 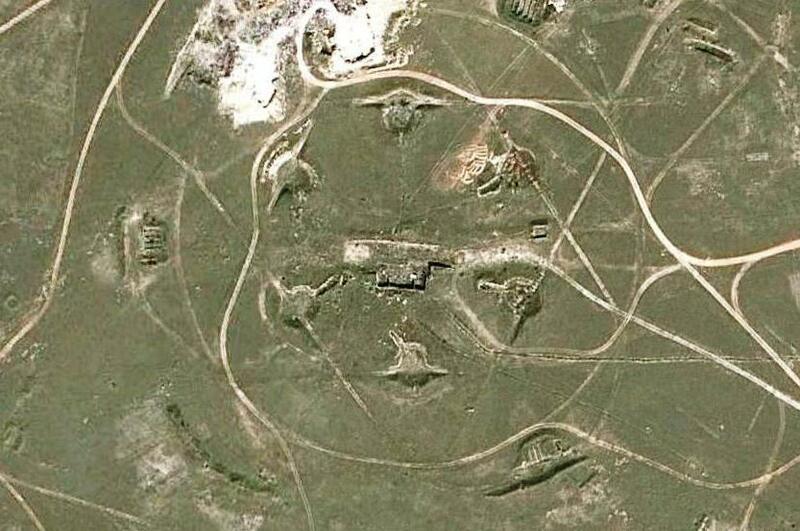 Ancient Signposts reveals undisclosed secrets of geoglyphs located around the world. Over 200 documentary photos.To order go to Amazon.com or click below. 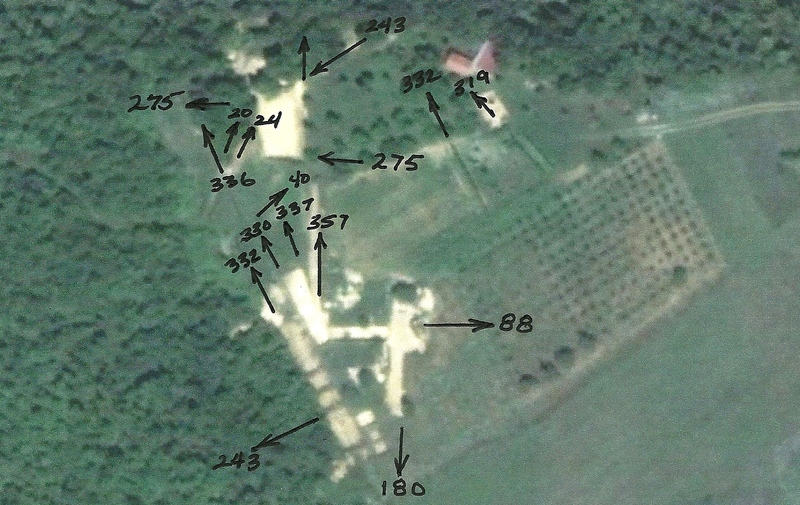 This paper details the results of a geoglyphical study of the newly discovered Bosnian Pyramids at Visoko, Bosnia. 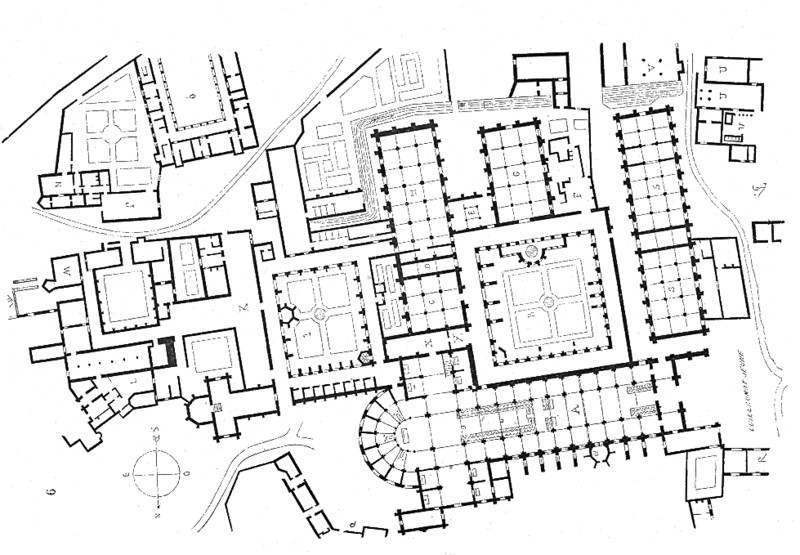 The practice of using the geometry of ancient structures to release hidden details of their origins is not a new practice. This practice has been handed down through secret societies since even before the building of the Bosnian pyramids. I call the re-discovery and application of this ancient practice Geoglyphology. The function of Geoglyphology, as it relates to Archeology, is to expand both the search area and the knowledge base available to the Archaeologist. Until now the majority of the information available to the Archaeologist is gleaned from the information recovered at the dig site. In recent years it has been discovered that a great majority of the ancient architectural, monolithic and geoglyphic structures built around the world have something in common. That commonality is that the structures were aligned in such a manner that the study of their linier alignment unveils a much larger story and immensely expands the data available to the archeologist and the related disciplines. Data recovered from sites that included Geoglyphology in their study included; Obtaining the geographical range of the culture being studied, the level of sophistication that existed in relation to their understanding of mathematics and geometry, their knowledge of world geography, the discovery of other archeological sites that were unknown prior to the studies, and the dating of the culture itself from the data collected at related offsite locations identified by the alignments at the dig site. The success of these studies shows that Geoglyphology can play a major role in expanding the knowledge base available to the Archeologist. Note: The calulations performed during the writing of this paper required the use of a special software called “Google Earth”. Google’s software is able to calculate true spherical bearings on the curved surface of the earth and then display them correctly on a flat plane. It is difficult to grasp the concept that two parallel headings can cross. That is because we are used to thinking in terms of Plane Geometry on a flat plane. However, all this changes when you draw lines on a sphere. In dealing with a sphere you enter the realm of Spherical Geometry. In Spherical Geometry there are no parallel lines. Spherical Geometry is the study of figures on the surface of a sphere, as opposed to the type of geometry studied in plane geometry or solid geometry. In spherical geometry, straight lines are great circles, therefor any two lines will always cross in two places somewhere on the sphere. An acomplished mathamatician, as were the ancients, can use a line to point to a distant object, or use two lines to come together at a distant point to highlight an important place to the builder, or three lines to make a triangle. The angle between two lines in spherical geometry is the angle between the planes of the corresponding great circles. A spherical triangle is formed using three great circle lines and is defined by its three angles. In the field of Geoglyphology, we are plotting lines in a spherical world and then displaying the results on a flat plane. It is difficult to grasp the concept of combining Spherical Geometry with Plane Geometry. 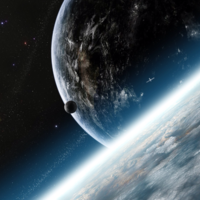 That is why the new field of Geoglyphology could not have been proposed without the advent of software that computes using Spherical Geometry which then displays the results on a flat plane. This type of precise mapping precludes the plotting of these bearings on a flat map. 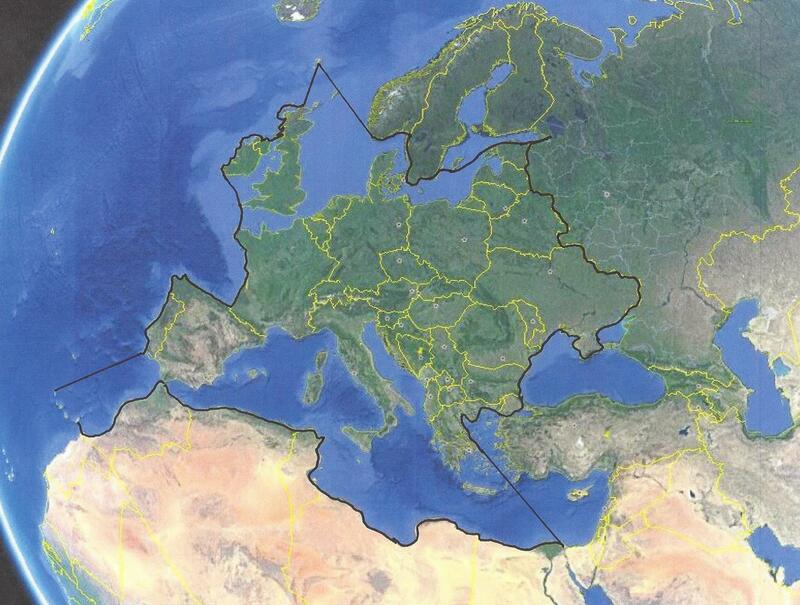 Maps become distorted when converted from a sphere to a flat map. 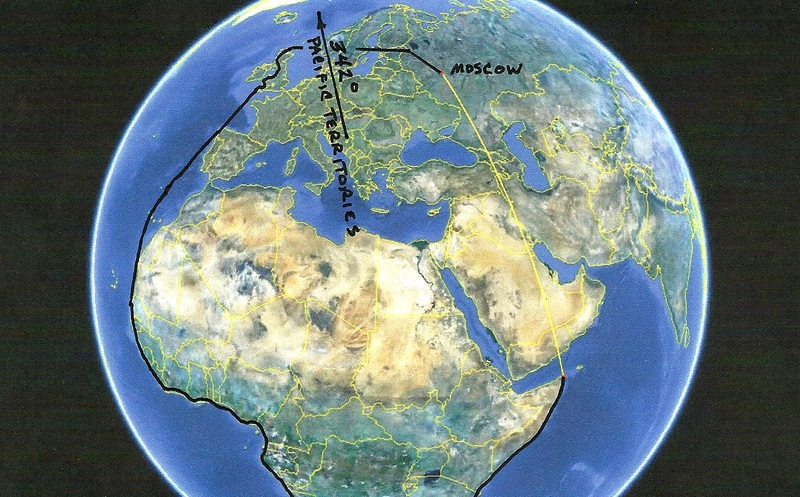 Any lines that are depicted in this article on a flat, non-satellite map were first plotted using the software and then drawn on the flat map after the end points were determined. Even then, the proper curvature is missing. The compelling question is; what knowledge did the ancients possess, 12000 years ago, that allowed then to do these calculations. 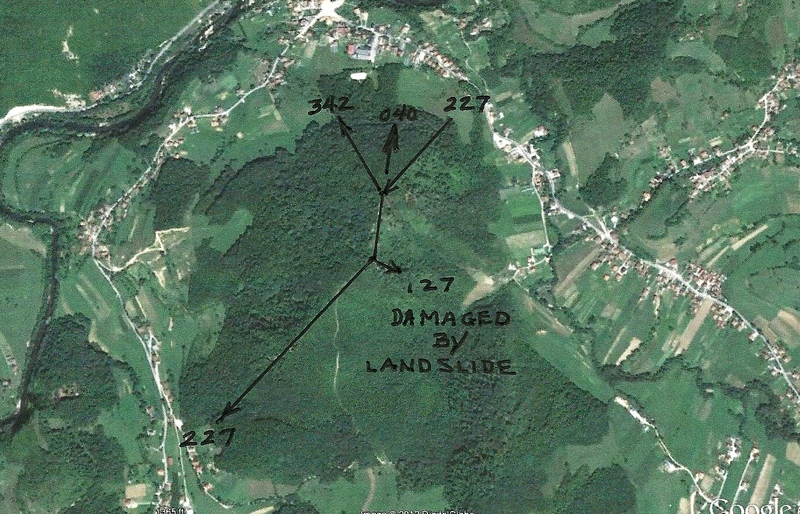 The Bosnian site appears to contain early, post-apocolyptic, geometric structures. The early post apocolyptic age of this site is determined by the vast area that it encompasses. Previously studied large structures of this era have outlined much smaller geographical areas. The vastness of the area which this geoglyph outlines would indicate that it was constructed before the previously studied structures which outline smaller areas within this larger geoglyphical area. The disection of the larger area could be no better demonstrated than from the two geoglyphs that were constructed, millinia later, on the crests of both the Pyramid of the Sun and the Pyramid of the Moon. Later generations placed these geoglyphs there in order to outline smaller, and more up to date, geoglyphical areas within the original territory. From the information provided in the geoglyphs a general date of their placement can be derived. This is possible through camparing the ancient history of those who practiced Geoglyphology with the geometry contained in the two geoglyphs. The reference to the Pacific Territories, in both the pyramid geometry and the geoglyph geometry, indicates a knowledge of, and a relationship with, the Pacific cultures of the time. 077 Degree Radial – Mouth of the Danube River and Boubdary Between Ukraine and Romania. 105 Degree Radial – Entrance to the Black Sea North of Istanbul. 250 Degree Radial – Northern Island in the Canary Islands. 360 Degree Radial – Southern Tip of Gotland Island. 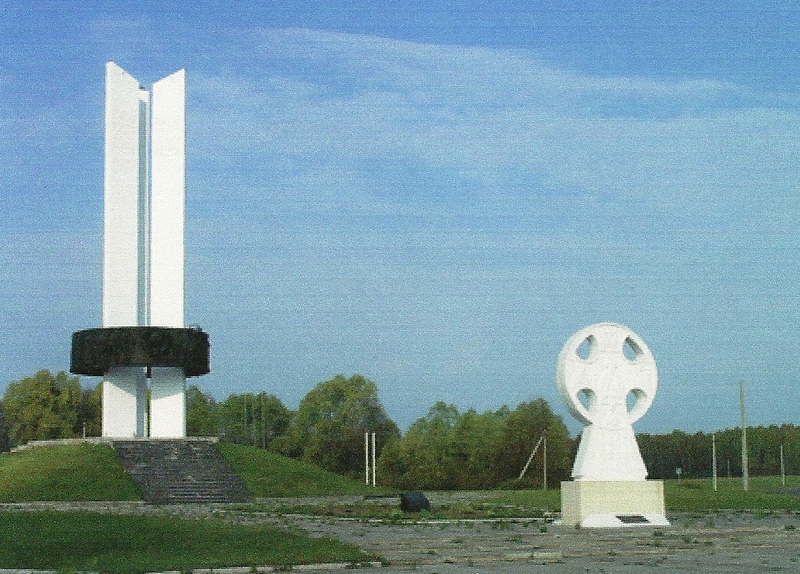 024 Degree Radial – Intersection of the boundaries between Latvia, Balarus and Russia. 088 Degree Radial – Where the boundaries between Romania and Bulgaria meet the Black Sea. on the top of the marker. This territorial marker stands at the intersection of the boundaries of the Ukaraine, Balarus and Russia. from the modern age they never the less commemorate the culture that divided the continent. 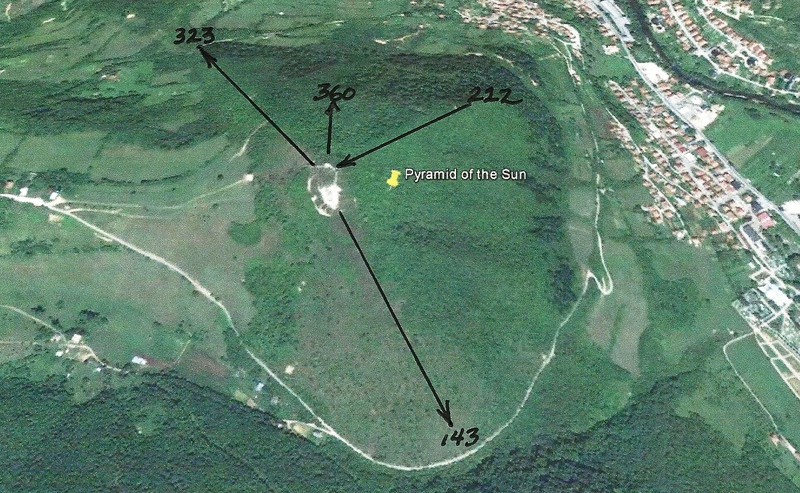 The Bosnian Pyramids, although unique, follow the protocols of later, more defining, and more sophisticated structures of the same era. 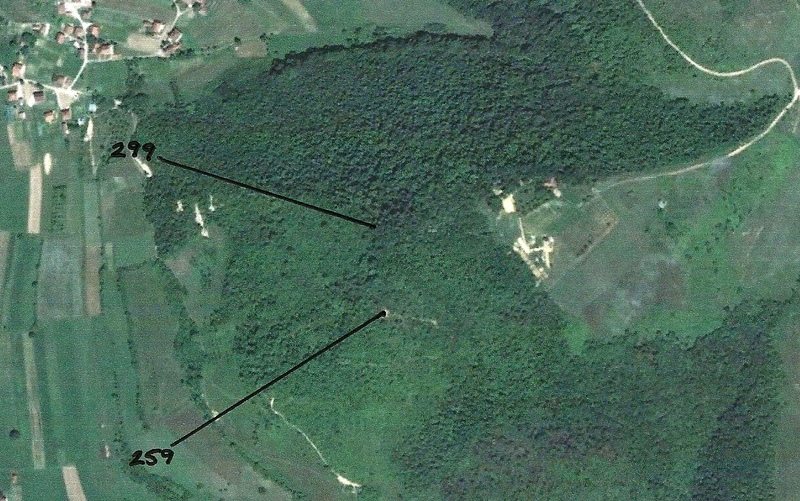 The Bosnian Pyramids are unique in that they are less symetrical, are of a cruder construction, and encompass a much larger area of difinition. This crudness alone could indicated a culture that is recovering from a catastrophe that left them with their past knowledge but without the tools to excercise that knowledge effectively. The increasing sophistication of pyramids which follow this era, leading up to the Egyptian era, would seem to confirm this hypothsis. 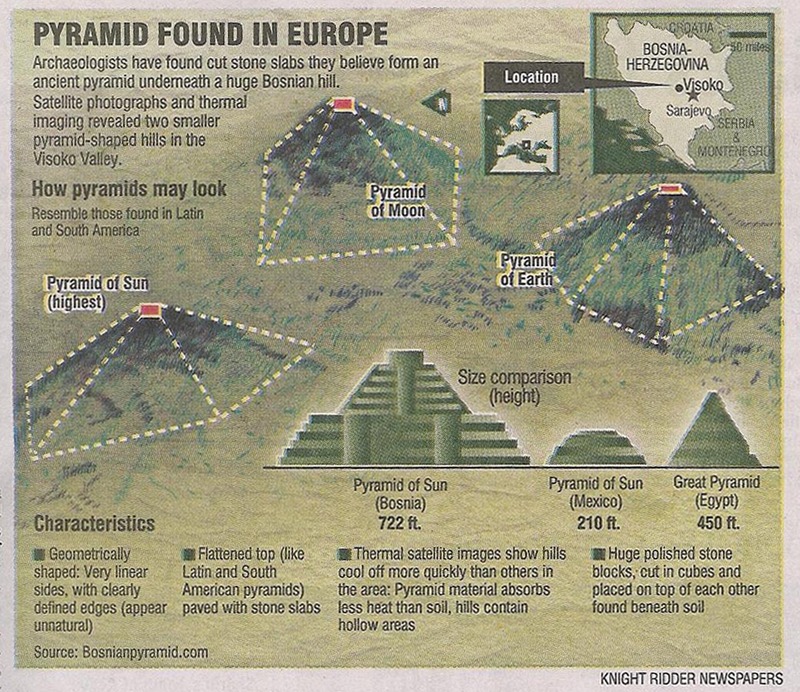 Conversly, the non-physical attributes of the Bosnian Pyramids would seem to indicate a culture with a superior knowledge of physics. History tells us that the Celts once occupied what is now called Europe. Recent research indicates that the geoglyphs placed atop the Bosnian Pyramids, long after they were constructed, are Celtic in nature. A timeline of the geoglyphs construction should be developed from an archeaological dig. With the aid of satellite imagery from Google Earth, soon archeologists in Brazil will be finding more and more large geometric designs carved into the ground in the Amazon rainforest. The geoglyphs are believed to have been sculpted by ancient people from the Amazon region around 700 years ago, though their purpose is still unknown. 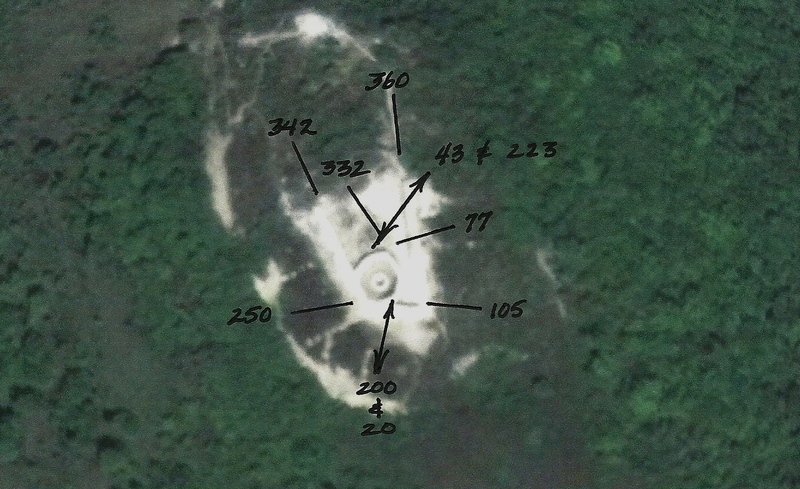 So far, nearly 300 geoglyphs have been identified, but with advances in satellite imaging–and increased clearing of the junglecoverage–scientists are hoping to discover many more of these strange, geometric designs.One of the factors that contributed to so many geoglyphs being undetected prior to the aid of satallites is their enormous size. According to leading geoglyph scientist Alceu Ranzi, his latest discoveries–five sets of geometric shapes, with circles, squares and lines–can measure more than a mile from one extreme to another. 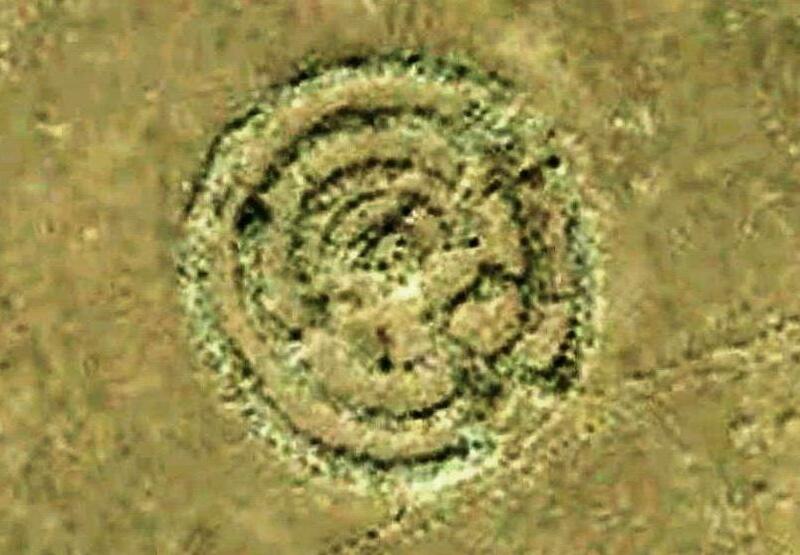 Because they’ve been so hard to find, the first geoglyphs weren’t discovered until the 1970s. Since then, scientists have been trying to piece together what significance they may have had to ancient Amazonians. What ever the purpose may have been, there’s one thing that is certain: the ancient civilizations of the rainforest were more numerous and sophisticated than previously imagined. According to a report from Globo, the new marks were only discovered because the jungle coverage had been removed to due to deforestation in the Amazon. 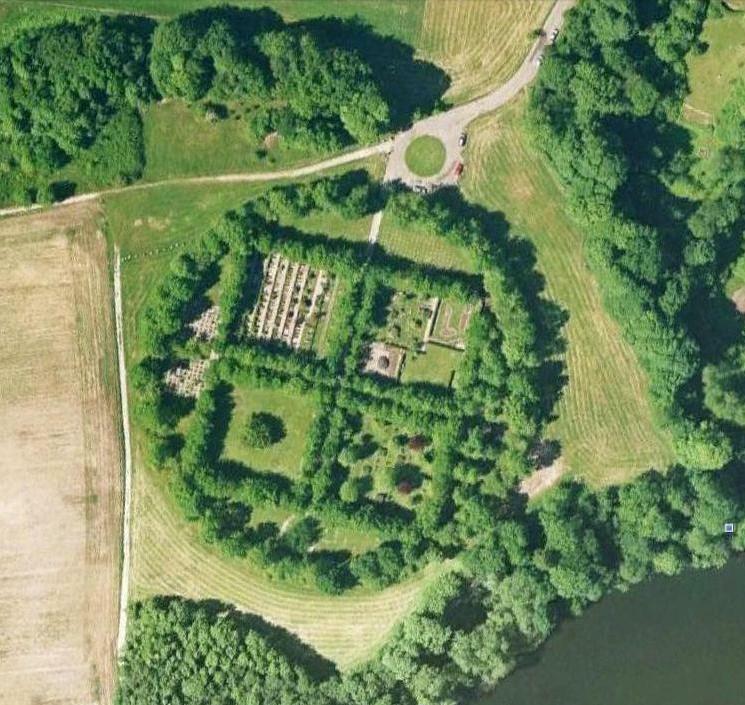 These structures are deep, with grooves are as large as 12 meters wide and four deep, but it is believed that they were built when jungle abounded–which would make their construction all the more difficult.